A perfect gift for chilli lovers, designed with the emphasis on taste. 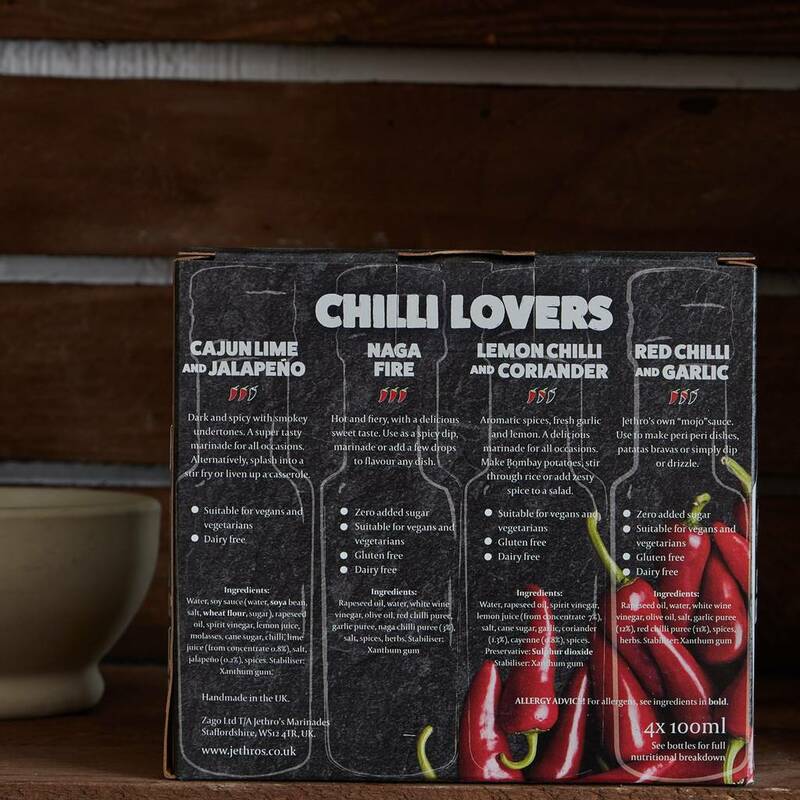 Don't be fooled by the professional design and classic appearance as these chilli sauces are all handmade in our family business. 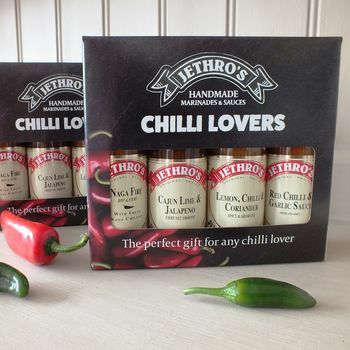 No "blow your whatever off" gimics, just great tasting and chilli-licious flavours with a range of mild to very hot chilli sauces included in this chilli gift selection. Vegan and vegetarian friendly recipes without dairy or animal products used in any of our ingredients or their production. Jethro's own "mojo" sauce. 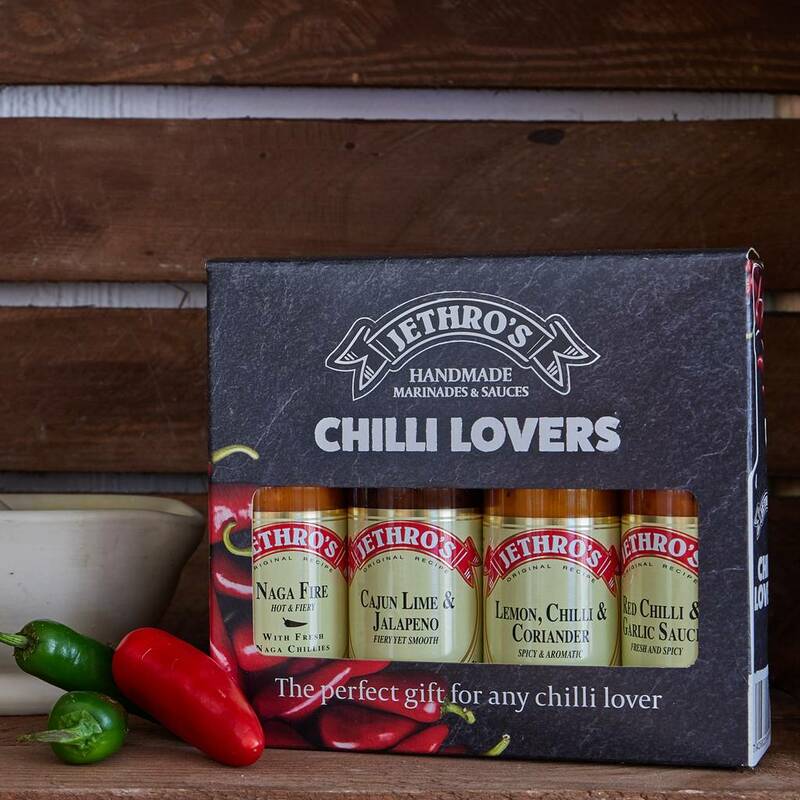 Use for peri peri chicken, patatas bravas or simply use as a condiment or dressing. How can something this tasty be absolutely sugar free, free of any additives or preservatives and gluten free? Don't be fooled by the initial taste tingling smack of lime - this will subside to delicious deep spicy flavours with smokey undertones. A fantastic marinade or try with stir fries, casseroles, cheese on toast; well just about everything really. As its name suggests, this is hot and fiery and not for the faint hearted. Even in this intensity of heat there is taste which keeps coming. In fact it will be hard to imagine such a nice sweet taste without any sugar at all but it's true - zero sugar added. Use as a spicy dip, marinade or add a few drops to flavour any dish. This won 1st prize in the Hot Chilli Sauce Category, Great Dorset Chilli Festival 2018.